I know that we are probably a bit late in putting this up, but better late than never, right? On some random shopping last week I finally spotted the Colossal Kohl in Turquoise at a local beauty store and since it was being raved everywhere I had to try it out myself... Ok, Ok, I got tempted by the turquoise colour too..it is summer afterall! It comes in the familar yellow twist up pencil and metallic turquoise accents... which I really like! Full marks for the nice packaging. Texture is smooth and it glides on well. It is soft and prone to crumbling (happened with me more than once) so make sure to use it with a light hand and do not twist up a lot for use. Pigmentation is decent, you will need 2-3 swipes for a full good colour. It stays on my eyes for 8+hours easily and around 5 hours on my waterline. It does smudge a little but nothing too bad. You will need a makeup remover to get this off completely. True to its name, the colour is a bright Turquoise, metallic with tiny blue shimmer, which isn't very visible to the naked eye... you can see it in macro shots. It is a very bright fun colour to try especially in the summers and will perk up your face instantly. 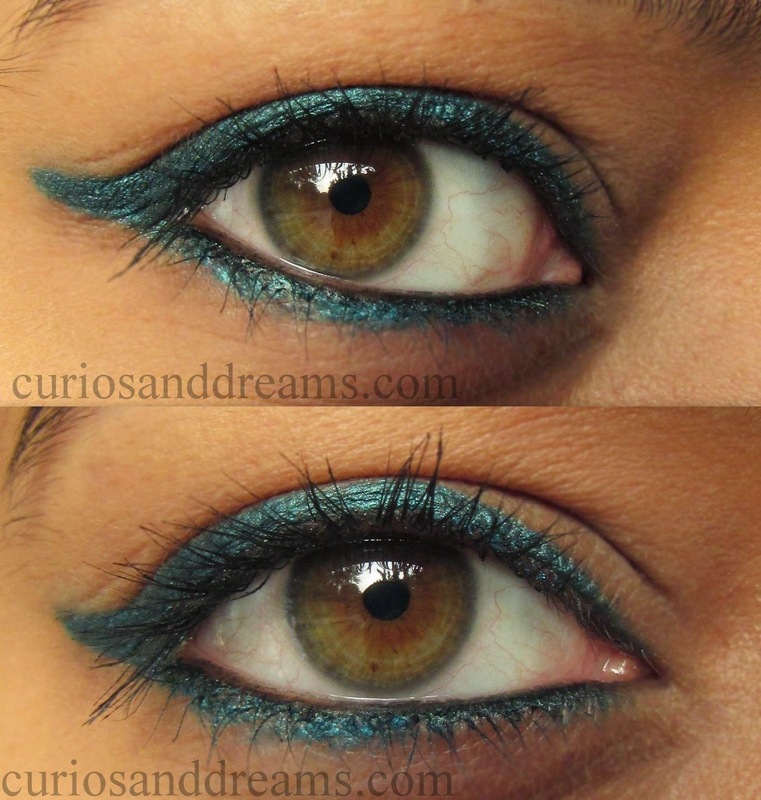 Line your upper and lower lash line (and your waterline if you aren't sensitive) with the Colossal Turquoise. Apply mascara and done. Simple! Line your upper lash line and waterline with a black kajal and wing it out a bit. Smudge the kohl on the waterlin to make it softer. Now go over your black line with Colossal Turquoise. It gives a great dimension to the colour! Apply you favourite mascara. Line your upper lash line, lower lash liner and water line with black kajal. 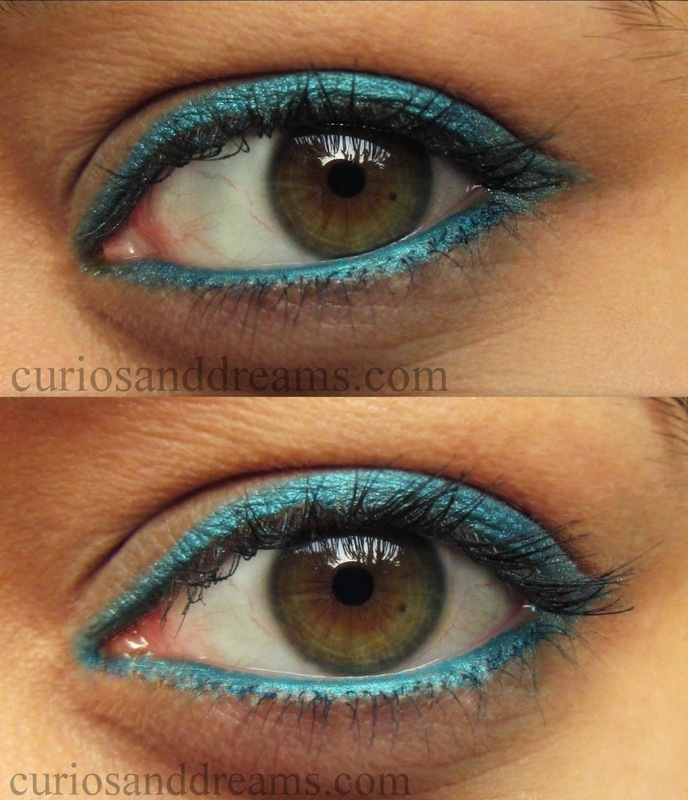 Apply Colossal Turquoise on lower lash line and smudge it softly. Some mascara and that's it. Have you tried the Colossal Turquoise yet? Did you like the different looks? Which is your favourite way of wearing it?